In a small bowl, combine yeast, 1 tbsp of the sugar and water and whisk until yeast is dissolved. Let sit 5 minutes until mixture is foamy. Meanwhile, melt 6 tbsp butter in a small saucepan, add milk and heat until lukewarm. Pour into the bowl of a stand mixer. Add in yeast mixture, remaining sugar, 2 cups flour and salt. Mix with the paddle attachment until just combined. Gradually add in remaining flour until the dough stops sticking to the sides of the bowl. Knead dough by hand or in stand mixer with dough hook attachment about 10 minutes, or until dough is smooth and elastic. Meanwhile, make coconut filling: In a medium bowl, combine coconut flakes, 3 tbsp melted butter, honey and egg. Divide risen dough into 10 equal pieces. Flatten each piece into a 5 x 3-inch rectangle. Place about 1 1/2 tbsp filling in the center of each piece, fold in long sides and roll up from the short end, pinching the seam closed with your fingertips. Place buns seam-side down on a baking stone or parchment paper-lined baking sheet about a 1/2-inch apart (to get that pull-apart effect). Let buns rest about 20 minutes. Once buns have rested, brush the tops with a light coating of egg wash and sprinkle with sesame seeds. Bake about 20 minutes or until golden brown. Serve immediately. Today is the start of Chinese New Year. To be honest, I don’t know much about this holiday, but I do know two things about it now (thanks to Wikipedia) that I’m a big fan of. The first is the tradition of cleaning one’s house from floor to ceiling to rid the home of ill fortune. I’m quite the clean freak, so I’m all for this one. 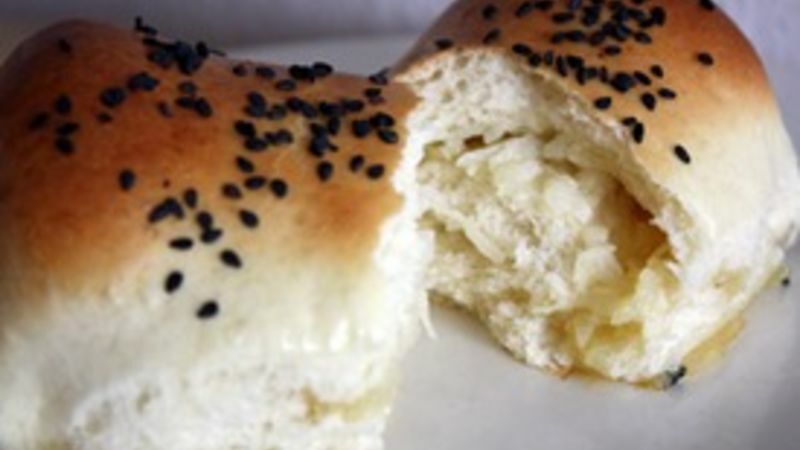 The second tradition I like most is making yummy food, like these delicious Chinese Coconut Buns, or cocktail buns, as they’re called in some circles. Okay, making cocktail buns isn’t necessarily a tradition for Chinese New Year, but if you plan on celebrating with food, this is a perfect way to do it. Despite how complicated they may seem to make, these soft, sweet, coconut-filled buns are really very easy to make – and all it takes is a couple of hours (most of which is spent lounging around waiting for the dough to rise). Placing filling in bread can be a daunting process, but over time I’ve learned that even if the outcome isn’t perfect (i.e. half the filling spills out onto the baking sheet in an unavoidable gooey mess), the result will still be delicious. Plus, many recipes call for extra filling anyway to account for the losses. So don’t be afraid to make this recipe just because there’s coconut filling inside the bun. Trust me – it’s worth the effort. With a light, buttery pillow of bread surrounding a creamy coconut center, all topped off with crunchy sesame seeds, these buns are a tasty way to ring in the New Year – er, Chinese New Year, that is.